Transliteration is the process whereby the text of one alphabet is converted into that of another. Within the realm of Western scholarship on the Middle East, transliteration is essential in order to represent characters, words, and phrases from Arabic, Hebrew, Persian, and other languages. A uniform transliteration system is necessary to avoid confusion. Non-systematic transliteration results in numerous variants of one word; some examples: the Hebrew חנוכה (Ḥanukkāh, Ḥanukkah, Hanukkah, Chanukah, Chanukkah, Chanuka, Hanuka, etc. ); the Arabic محمد (Muḥammad, Muhammad, Mohammed, Mahomet, etc); and the Persian نو روز (Now-Rūz, Now-Ruz, Noruz, Naw-Rúz, Nawruz, etc). Unless otherwise noted, on this website and in my scholarship, I follow a standard academic format, with some minor changes, in transliterating Arabic, Hebrew, and Persian. These systems are used by leading academic and scholarly publications and resources (with slight modifications). The tables below are designed to serve as a reference tool for readers and students. Clicking on the icon [ ] throughout the text below will bring up images of various other transliteration schemes. For transliteration of Arabic (known in Arabic as ʿarabiyyah), I have chosen to conform to the basics of the system used in the International Journal of Middle East Studies (IJMES) [ ], the new Encyclopædia of Islam, 3rd ed. (EI3), and the Library of Congress (LOC) [ ], with two major exceptions: I always mark the tāʾ marbūṭah (ة) with an ‘h’ and I assimilate the definite article (al-/-ال) into the sun letters, both stemming from an effort to make the transliterations approximate both orthography and pronunciation. Since Modern Persian (known in Persian as fārsī) is written using the Arabic alphabet, transliteration of Persian resembles very closely that of Arabic. Although a number of academic references tend to use an identical transliteration system for Persian and Arabic, I prefer to use a system similar to that of the Encyclopædia Iranica (EIr), with the minor difference of using consonantal digraphs. 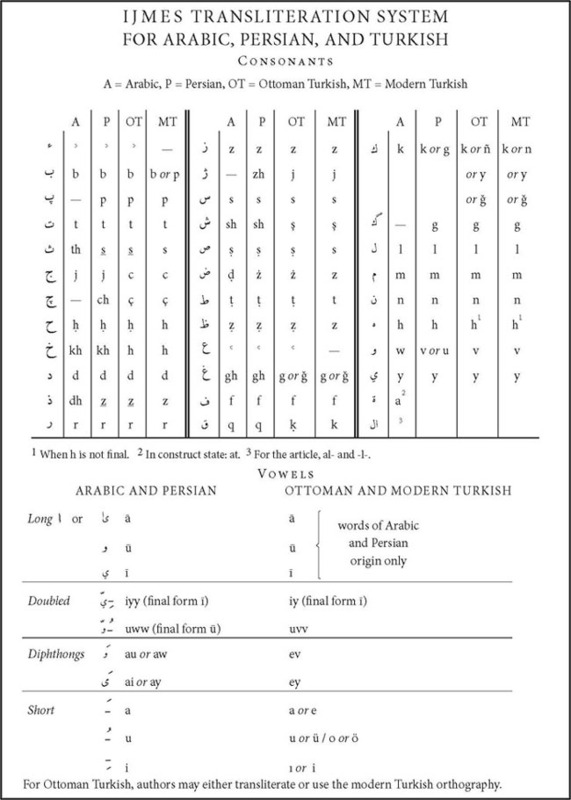 A major difference between the EIr system and the ‘Arabic-centric’ ones is that the short vowels are marked as they are pronounced in Persian (the Arabic ‘i’ and ‘u’ are the Persian ‘e’ and ‘o’). Hence, rather than write the name of the Iranian leader as ‘Khumaynī’, as an Arabic-reader would read it, I write ‘Khomeynī’; the spelling of Persian individuals bearing Arabic names follows this pattern (e.g., ʿAżod od-Dowleh, not ʿAḍud ad-Dawlah). With a few exceptions, I write Middle Persian words and names as they appear in modern Persian (e.g., Pīrūz, not Pērōz). 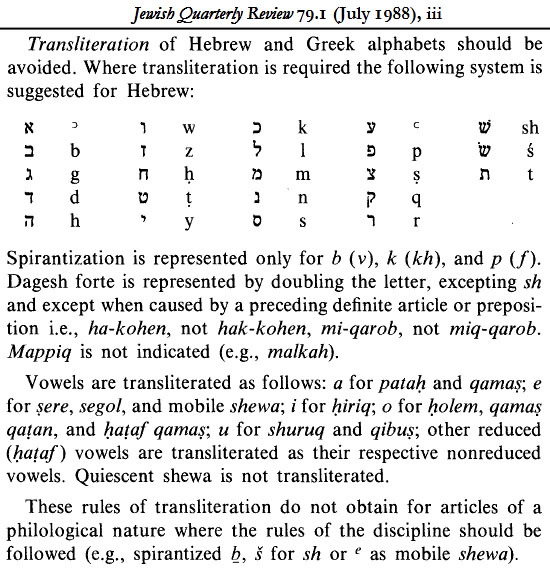 For transliteration of Hebrew (known in Hebrew as ʿivrīt), I have adopted a method, essentially that of the Society of Biblical Literature (SBL) [ ] and similar to that of the Jewish Quarterly Review (JQR) [ ], which highlights its shared elements with other Semitic languages. One difference from the SBL is that I transliterate the final héh (ה-), which marks the vowel ā, in order to represent the orthography. Unlike with Arabic, I do not mark doubled letters caused by the assimilation of the definite article (ha-/-ה) into sun letters; since the assimilation is neither pronounced nor visually apparent in Hebrew, transliterating it as such may prove confusing (thus, ha-kohén and not hak-kohén). The same goes for a number of the fricatives that are no longer in use (e.g., /th/ [תּ/ת], /dh/ [דּ/ד]). Because transliteration of Hebrew vowels is complex and often unnecessary, I do not usually mark them with macrons or other symbols. When both Arabic and Hebrew transliterations appear frequently within a study, I transliterate slightly differently, in order to highlight the similarities between the two languages. 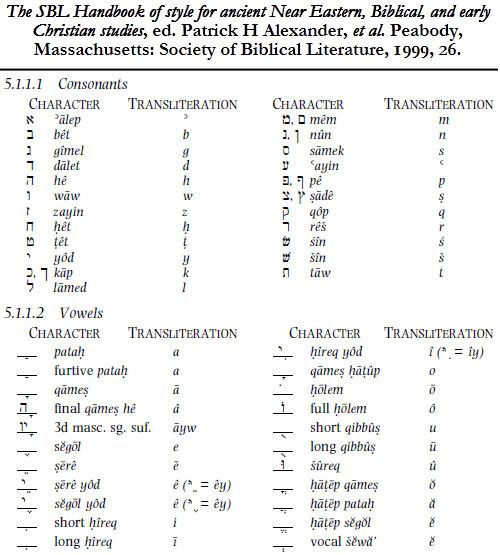 The Hebrew and Arabic alphabets along with respective transliterations into the Latin alphabet. Source: D Gershon Lewental (DGLnotes). Please note that not all of these events are open to the general audience; please check with the organisers to confirm. 08 February 2019, 09.20—‘Myths and facts of the modern Middle East’ (Wiesbaden High School): Floridastraße 26, Hainerberg Army Base, Wiesbaden, Germany. 03 November 2018, 12.30—‘Between Byzantium and Iran: Caucasian peoples and the Arab-Islamic conquests’ (11th annual conference of the Association for the Study of the Middle East and Africa): Key Bridge Marriott Hotel, Washington, DC. 09 October 2018, 17.30—‘Radical Islam: What makes it “radical”?’ (Oriental Institute, Czech Academy of Sciences): Národní 3, Room 108, Prague, Czech Republic. 06 September 2018, 12.00—‘Arab-Israeli conflict: Where to now?’ (Center for Middle East Studies brown-bag lecture series, University of Oklahoma): Farzaneh Hall 145, Norman, Oklahoma. 16 August 2018, 15.45—‘The “Fighting Persians” and the “Fighting Romans”: “Seventh-Century Madness” in later Muslim annals’ (12th biennial conference of the Association for Iranian Studies): Jordan Center for Persian Studies and Culture, University of California, Irvine, California. 20 July 2018, 11.30—‘Remembering the Battle of al-Qādisiyyah: History and memory in early Islamic civilisation’ (5th World Congress for Middle Eastern Studies): Seville, Spain. 11 April 2018, 11.30—‘What is radical Islam and why is it so “radical”?’ (University of Oklahoma in the United Kingdom): Lakenheath Air Force Base, Lakenheath Education Centre, Building 948, Room 205, Lakenheath, England. 17 March 2018, 16.00—‘Armenians, Georgians, and Albanians and the initial Sāsānian response to the Arab-Islamic expansion’ (8th biennial congress of the Association for the Study of Persianate Societies): Ilia State University, Tbilisi, Georgia. 21 November 2017, 10.30—‘Call-and-response battles in Syria and Iraq: The Literary construction of Islamic collective memory’ (51st annual meeting of the Middle East Studies Association): Marriott Wardman Park Hotel, Washington, DC. 15 November 2017, 15.00—‘Tajikistan between Iran and Islam: Nationalism and identity in post-Soviet Central Asia’ (Farzaneh Family Center for Iranian and Persian Gulf Studies, University of Oklahoma): Farzaneh Hall 145, Norman, Oklahoma. 07 November 2017, 17.30—‘Minorities and the Jewish state: The Druze, Circassian, and Bahāʾī communities of Israel’ (International Studies Lecture, Texas A&M University): Harrington Education Center 108, 540 Ross St, College Station, Texas. 07 November 2017, 12.00—‘What is radical Islam and why is it so “radical”?’ (Institute for International and Immigration Law, Texas Southern University): 3100 Clerbourne St, Room 105/106, Houston, Texas. 06 November 2017, 10.00—‘“Micro-minorities” in Israel: Druze, Circassian, and Baháʾí communities and the Jewish State’ (International Studies Institute, University of New Mexico): Lobo A & B, Room 3037/3039, Student Union Building, 1 University of New Mexico, Albuquerque, New Mexico. 03 November 2017, 18.15—‘Jewish and Christian minorities in the mediæval Islamic world’ (Medieval Fair Lecture Series, Center for Medieval & Renaissance Studies, University of Oklahoma): Norman Public Library West, 300 Norman Center Court, Norman, Oklahoma. 20 October 2017—‘Iranian exiles in Istanbul and Ottoman–Qājār relations’ (10th annual conference of the Association for the Study of the Middle East and Africa): Key Bridge Marriott Hotel, Washington, DC. 01 April 2017, 18.00—‘What is the Middle East?’ (Moore Baháʾí Cultural Event): 1516 SW 38th Street, Moore, Oklahoma. 28 October 2016, 10.30—‘Iranians, Ottomans, and Europeans in the Nineteenth-Century entrepôt of Istanbul’ (9th annual conference of the Association for the Study of the Middle East and Africa): Key Bridge Marriott Hotel, Washington, DC. 04 August 2016, 08.45—‘Under the banner of Iran: The Derafsh-e kāveyān as a changing emblem of Iranian identity from the Sāsānian era to the present’ (11th biennial conference of the International Society of Iranian Studies): Vienna, Austria. 21 June 2016, 09.00—‘Beyond “Israel studies”: The Case of Bahāʾīs and Jews in the Holy Land, 1917–1957’ (32nd annual meeting of the Association for Israel Studies): Jerusalem, Israel. 04 May 2016, 11.00—‘The Holocaust and our world today’ (panel participant) (Holocaust Remembrance and Restitution Society’s Holocaust Remembrance Week): Beaird Lounge, Oklahoma Memorial Union, 900 Asp Ave, Norman, Oklahoma. 03 May 2016, 20.00—‘Jews, Christians, and Ottoman society: Minorities under Islam’ (Second Wind Ministries and Episcopal Student Association): Second Wind Coffee House, 564 Buchanan Ave, Norman, Oklahoma. 14 April 2016, 18.30—‘Israel: Ask me anything’ (Hillel at the University of Oklahoma): 494 Elm Avenue, Norman, Oklahoma. 17 March 2016, 16.00—‘Epic encounters? Narrative, archetypes, and myth in Islamic historiography’ (Interdisciplinary Islamic Studies Seminar and Islamic Studies Program lecture series, University of Michigan): International Institute, Room 1644, 1080 S University Ave, Ann Arbor, Michigan. 18 March 2016, 11.00—‘Vernacular Islam’ (Interdisciplinary Islamic Studies Seminar workshop, University of Michigan): International Institute, Room 1644, 1080 S University Ave, Ann Arbor, Michigan. 06 March 2016, 19.00—‘Reflections on the future: How societies use religion, memory, and conflict to define and maintain their identities’ (Tulsa Jewish United Fund Campaign kickoff lecture and reception, Jewish Federation of Tulsa): Charles Schusterman Jewish Community Center, Sylvan Auditorium, 2021 E 71st Street, Tulsa, Oklahoma. 29 February 2016, 18.30—‘Israel: Ask me anything’ (Hillel at the University of Oklahoma): 494 Elm Avenue, Norman, Oklahoma. 08 February 2016, 12.00—‘Israel and the Palestinian territories in 2015—A Retrospective’ (Center for Middle East Studies brown-bag lecture series, University of Oklahoma): Hester Hall 145, Norman, Oklahoma. 22 November 2015, 08.30—‘From Israelites to Muslims: Biblical paradigms in the Futūḥ literature’ (49th annual meeting of the Middle East Studies Association): Sheraton Denver Downtown Hotel, Denver, Colorado. 09 November 2015, 19.00—‘Recent trends and tensions in Israeli politics and society’ (Jewish University adult education series, Jewish Federation of Greater Oklahoma City): Jewish Federation of Greater Oklahoma City, 710 W Wilshire Blvd, Suite 103, Oklahoma City, Oklahoma. 30 October 2015, 08.30—‘The Derafsh-e kāveyān: The Pre-Islamic Iranian national standard in myth, history, and memory’ (8th annual conference of the Association for the Study of the Middle East and Africa): Key Bridge Marriott Hotel, Washington, DC. 20 October 2015, 19.15—‘Israel 101’ (Hillel at the University of Oklahoma): 494 Elm Ave, Norman, Oklahoma. 07 October 2015, 20.00—‘The Rise of Islam and the Arab-Islamic conquests in their historical perspective’ (Episcopal Student Association, St Anselm of Canterbury Episcopal Student Center): 800 Elm Avenue, Norman, Oklahoma. 09 September 2015, 15.15 (Panel 16)—‘Symbols of (Iranian) empire: Banners, thrones, carpets, and pearls in Arab-Islamic conquest narratives’ (7th biennial congress of the Association for the Study of Persianate Societies): Mimar Sinan Fine Arts University, İstanbul, Turkey. 04 May 2015—‘Finding truth in the Futūḥ: Challenges in studying the Arab-Islamic conquests’ (Department of Near Eastern Studies colloquium series, Cornell University): White Hall, Ithaca, New York. 23 March 2015, 19.00—‘From Protective Edge to pre-emptive elections: Israeli news and analysis’ (Jewish University adult education series, Jewish Federation of Greater Oklahoma City): Jewish Federation of Greater Oklahoma City, 710 W Wilshire Blvd, Suite 103, Oklahoma City, Oklahoma. 16 March 2015, 18.00—‘Radical Islam and the Arab-Israeli conflict’ (‘Arab-Israeli conflict’ guest lecture, Tulane University): Dinwiddie Hall 103G, New Orleans, Louisiana. 14 March 2015, 09.00—‘The (Gem) star-spangled banner yet waves’: Iranian priceless treasures in early Islamic history and memory’, (225th meeting of the American Oriental Society): Crowne Plaza French Quarter, New Orleans, Louisiana. 10 March 2015, 12.00—‘Israeli elections primer: Understanding and interpreting the 17 March 2015 elections’ (Department of International & Area Studies, University of Oklahoma): Hester Hall 145, Norman, Oklahoma. 08 March 2015, 18.30—‘Israeli culture and cuisine’ (Faculty-in-Residence country culture night, University of Oklahoma): Kraettli Faculty-in-Residence House, Norman, Oklahoma. 11 February 2015, 12.00—‘Narratives of Islamic historiography: Reading historical texts as literature’ (Center for Medieval and Renaissance Studies brown-bag lecture series, University of Oklahoma): Ellison Hall 132, Norman, Oklahoma. 14 December 2014, 09.30—‘Bahāʾīs and Jews in the Holy Land, 1917–1957: Symbiosis and scholarship’ (46th annual conference of the Association for Jewish Studies): Hilton Baltimore, Baltimore, Maryland. 23 November 2014, 14.00—‘Hero and Trickster in early Islamic historiography: The Case of the Qādisiyyah narratives’ (48th annual meeting of the Middle East Studies Association): Marriott Wardman Park Hotel, Washington, DC. 01 November 2014—‘From Settlement to Symbol: al-Qadisiyyah and the dehistoricisation of memory in mediæval narratives, sermons, and poetry’ (7th annual conference of the Association for the Study of the Middle East and Africa): Key Bridge Marriott Hotel, Washington, DC. 31 October 2014—‘Myth and memory in Islamic narratives: Saʿd and Abū Miḥjan at the Battle of al-Qādisiyyah’ (7th annual conference of the Association for the Study of the Middle East and Africa): Key Bridge Marriott Hotel, Washington, DC. 08 August 2014—‘Rostam’s death at al-Qādisiyyah: Early representations of Iranian identity in Islamic narratives’ (10th biennial conference of the International Society of Iranian Studies): Montréal, Québec. 18 April 2014, 12.00—‘The Iran-Iraq war of words: Enlisting nationalism and religion in combat’ (Center for the Study of Nationalism lecture series, University of Oklahoma): Ellison Hall 132, Norman, Oklahoma. 03 April 2014, 18.30—‘Israel and the US’ (Foreign Policy Association’s Great Decisions series): Norman Public Library, 225 North Webster Street, Norman, Oklahoma. 15 March 2014—‘Rustam’s death at al-Qādisiyya and the development of an Islamic Iranian identity’ (224th meeting of the American Oriental Society): Pointe Hilton Squaw Peak Resort, Phoenix, Arizona. 08 March 2014, 14.30—‘Iranian and Islamic heritage and the formation of Tajiki national identity’ (After the Persianate: Cultural heritage and national transformation in modern Iran and India, a conference of the Iranian Studies Program, College of International Studies, University of Oklahoma): Wagner Hall 135, Norman, Oklahoma. 28 February 2014, 18.30—‘The Tumultuous Seventh-Century: The Arab-Islamic conquests and the reshaping of the world’ (Medieval Fair Lecture Series, Center for Medieval & Renaissance Studies, University of Oklahoma): Norman Public Library, A/B Room, 225 North Webster Street, Norman, Oklahoma. 05 January 2014, 17.00—‘Creating and constructing heroes and anti-heroes in early Islamic historiography’ (1st meeting of the Iranian Studies Research Group, Institute for the Study of Asia and Africa and the Department of Islamic and Middle Eastern Studies, Hebrew University): Faculty of the Humanities Building 5318, Hebrew University of Jerusalem—Mount Scopus campus, Jerusalem, Israel. 26 December 2013, 18.15—‘The Iran-Iraq war of words, memory, and religious history’ (Iran Forum, Alliance Center for Iranian Studies, Tel-Aviv University): Gilman Hall 133, Tel-Aviv University, Tel-Aviv, Israel. 22 November 2013—‘“First”, “second”, and “third” battles of al-Qādisiyyah in Iraq, Palestine, and Syria: Early Islamic history and memory in radical Islamist discourse’ (6th annual conference of the Association for the Study of the Middle East and Africa): Key Bridge Marriott Hotel, Washington, DC. 17 November 2013—‘The Baháʾí faith and the State of Israel’ (Edmond Baháʾí Center): 321 E Campbell Dr, Edmond, Oklahoma. 18 October 2013, 18.30—‘Jews, Judaism, Israel, and the Middle East’ (Norman Baháʾí Center): 526 Iowa St, Norman, Oklahoma. 06 October 2013, 12.00—‘Between Egypt, Syria, and the Palestinian Territories: Israel in today’s Middle East’ (Norman Jewish Community Organization): Hillel Building, 494 Elm Ave, Norman, Oklahoma. 03 September 2013, 08.00 (Panel 4)—‘The Death of Rostam: Literary representations of Iranian identity in early Islam’ (6th biennial congress of the Association for the Study of Persianate Societies): Oriental Institute of Sarajevo and Bosniac Institute, Sarajevo, Bosnia. 01 February 2013, 20.30—‘History of the Baháʾí community in the Holy Land, 1917 to the present’ (Moore Baháʾí Cultural Event): 1516 SW 38th Street, Moore, Oklahoma. 18 January 2013, 12.00—‘An Israeli elections primer: Understanding and interpreting the 22 January 2013 elections’ (Department of International & Area Studies, University of Oklahoma): Hester Hall, Norman, Oklahoma. 07 January 2013, 18.30—‘The Rise of Jewish national identity in the modern world’ (Israel Cornell Club): Khan Museum of Ḥaderah, ha-Gibborim 74, Ḥaderah, Israel. 08 December 2012, 18.30—‘The Baháʾí faith in the Holy Land and Baháʾí-Israeli relations’ (Norman Baháʾí Center): 526 Iowa St, Norman, Oklahoma. 12 November 2012, 19.00—‘The Art of Zionism: Jewish national identity in the modern world’ (Jewish University adult education series, Jewish Federation of Greater Oklahoma City): 710 W Wilshire St, Oklahoma City, Oklahoma. 12 October 2012, 14.15 (Panel 2)—‘History for a purpose: An Analysis of “Ṣaddām’s Qādisiyyah”’ (5th annual conference of the Association for the Study of the Middle East and Africa): Key Bridge Marriott Hotel, Washington, DC. 03 October 2012, 12.00—‘The Bahāʾī faith in Israel and its community’s relations with the Jewish state’ (JuSt Lunch Brown-Bag Lecture Series, Schusterman/Josey Program in Judaic & Israel Studies, University of Oklahoma): Gittinger Hall 109, 760 Van Vleet Oval, Norman, Oklahoma. Due to its extensive use of diacritics, this site is best viewed using the open (free) font Gentium and UTF-8 encoding. Questions about transliteration? Click here for transliteration tables.